Nowadays most people associate wicked old witches with storybooks but, in the past, people thought there was a witch in every town and village. Very often some poor old woman, wizened and bent with age, might be thought of as a witch. Not always an old person either, sometimes someone quite young could be regarded as a witch. A witch would be blamed for anything that went wrong in the village, even something so trivial as milk going sour. Not all witches were bad. Some, who were known as white witches would have considerable knowledge of the healing powers of certain plants and herbs, and many people would go to them for help. 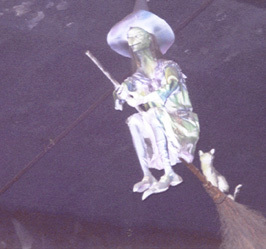 Most people's idea of a storybook witch, flying on her broomstick, seen here accompanied by her black cat!! One of the best-known symbols of Halloween is the turnip or pumpkin lantern. In Scotland, what are called turnips are what we call swedes. No-one really knows when the tradition of making these lanterns began, but it is believed that their origins go back for thousands of years. It is known that the ancient Celts regarded the human head as a charm against evil. Lanterns, carved in the form of heads were probably used by the Celtic Druids at their special Festival of the Dead as a guard against evil spirits and to welcome the souls of loved ones as they revisited at that time. It is widely believed that in much later times the face-lanterns were meant to frighten away any witches who might ride by at Halloween on their way back from their meeting with the Devil. A hollowed-out pumpkin with a carved face, looks very spooky with a candle inside!! In ancient times the apple was thought of as a holy or magical fruit. A Norse legend tells of how the gods kept their health and youth by eating the apples from the garden of Asgard, their home in the sky. The Celt believed in a paradise where apple trees carried fragrant blossom and ripe fruit at one and same time. 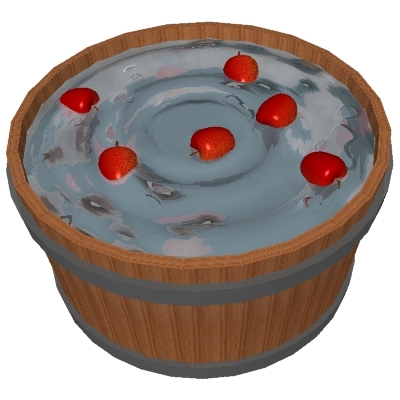 A well-known Halloween game is ducking or bobbing for apples, where some apples are floated in a large tub or bowl of water and players take it in turns to try to pick up and apple from the water using only their teeth. Apples are very good to eat at this time of year as they have just been harvested from the trees. Barrel of apples, but nowadays people can duck for apples in any suitable container, even a clean washing up bowl will do!! It is said that some people stir the water to make it more difficult!! Hallowe'en is short for All Hallows' Eve, the evening before All Hallows, or All Saints' Day, which is November 1st. (Hallow meaning saint or holy person). Another name for Hallowe'en is Samhain, meaning Summer's End, a Celtic festival, when winter, and also their new year, started. This was also the time of year when everything withered and died, and the priests of the Celtic people, the Druids would perform magic rites and offered sacrifices to their gods to make sure life and new growth would return in spring. The Druids thought all life came from the underworld and that was where the spirits of vegetation and growing things went during the winter. At Samhain the barriers between this world and the underworld were opened, and the Celts believed the spirits of their dead relatives would revisit their homes. The Samhain festival began with the lighting of huge bonfires, which were lit to drive away evil spirits, to honour the sun, and to give thanks to the gods for the crops and fruit which had been safely gathered in. The fires also guided the souls of the dead on their journey back from the underworld. People thought the ghosts of their dead relatives returned to comfort themselves at the fire before facing the cold and loneliness of the coming winter. As Christianity grew and spread many pagan customs and festivals continued but were given new names and meanings to fit in with Christian beliefs. Therefore in AD837 the Church leaders dedicated Nov 1st to the memory of the saints in Heaven, and called All Hallows' Day, but still the belief continued of the souls of the dead returning at this time of year, so the Church called Nov 2nd All Souls' Day, when people could say masses for their departed loved ones. As the centuries passed, people did not grow any less superstitious, and went on thinking of Hallowe'en as a time when witches and demons were active and when ghosts and spirits made an appearance.